Two free lots located east of Terminal 4 and west of Terminal 2. Express Pay - you can pay your parking fee in the elevator lobby of the garage - no waiting at toll both. Accessible parking is available in all garages and next to the bus stops in all economy surface lots. If you need extra time at the curb, Airport staff there may issue Special Needs permits. 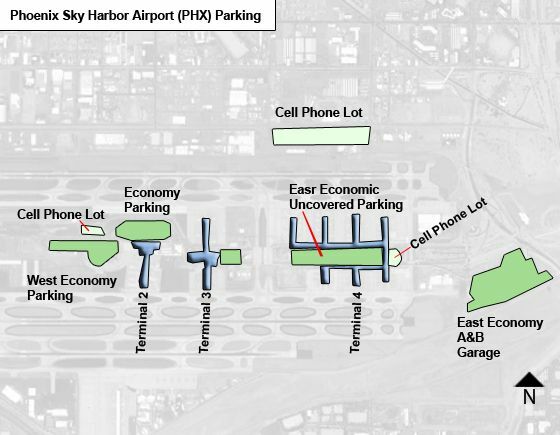 High-profile parking is available on the top level of Terminal 2 garage and in all economy surface lots, as well as just east of Terminal 4. Free airport shuttle buses run every 5 to15 minutes to & from all economy parking to terminals. For 24-hour parking information & availability, call: (602) 273-4545. Wifi in Terminal 4 West cell phone waiting lot?